How will emerging technologies alter our relationship to material consumption – for better or worse? 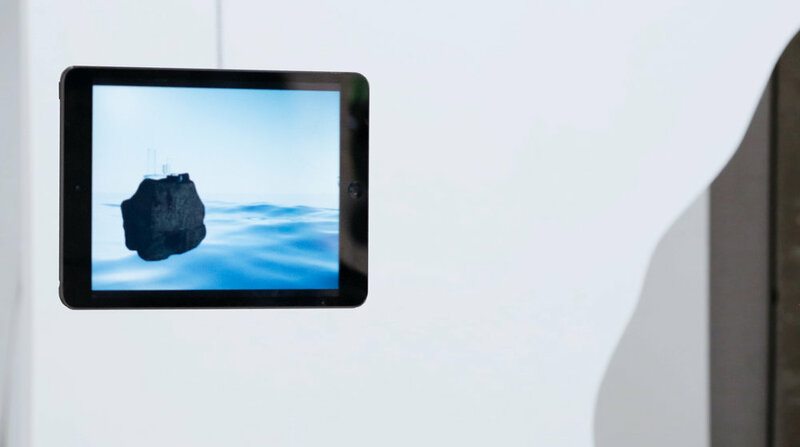 Above the Surface is an augmented reality (AR) artwork by that reimagines how we might desire – and consume – objects in the future. Could Augmented Reality lead to new desire and consumption patterns or will it rather create space for controlling our minds in a different way. The film Terrain focuses on how Augmented Reality can be used to create new and positive interactions with our environment. The film makes use of there different spaces in London and speculates how main materials, such as wood, stone, water and light could interact with human, machine and the environment in the future. The purpose of Terrain is to question the future role of digital experiences between the physical and digital landscape. 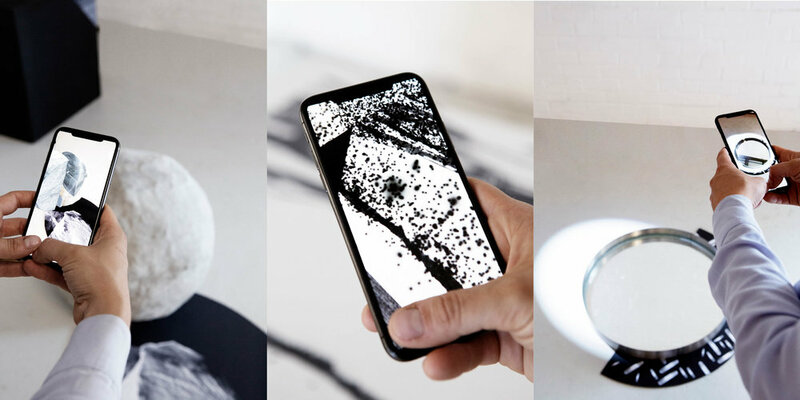 Finding A New Terrain is an augmented reality sculpture consisting of three digital experiences using stone, wood, print, water and light. The visitor is experiencing real material’s augmentation through a smartphone. This piece explores how different materials show different behaviours in an augmented space. The endangered black Ebony tree for example is tearing to particles, due to its deforestation; on the other side the exhibited stone transforms into pieces but merges into its origin form, due to its sustainable matter. The interactive projection piece Portal 1: A LANDSCAPE shows an abstract landscape and its changing colours during the day. In a playful way, this piece lets the viewer interact with a fictional growing landscape and machine vision. How does the landscape see us and how do we see our landscape? Can we create a new way in which human’s understand their impact on our environment and vice versa? Commissioned by the International Shortfilm Festival Oberhausen the installation explores in a playful way the space between human beings and their surrounded screens. Abstract computer generated animations express the moment in time when human interact and merge with screen technologies, such as smartphones, computer screens, TV’s or the space within the cinema.How do screens impact human's perception? Studio Above&Below was approached by gp_studio to create a new installation for their Studio Window Space. 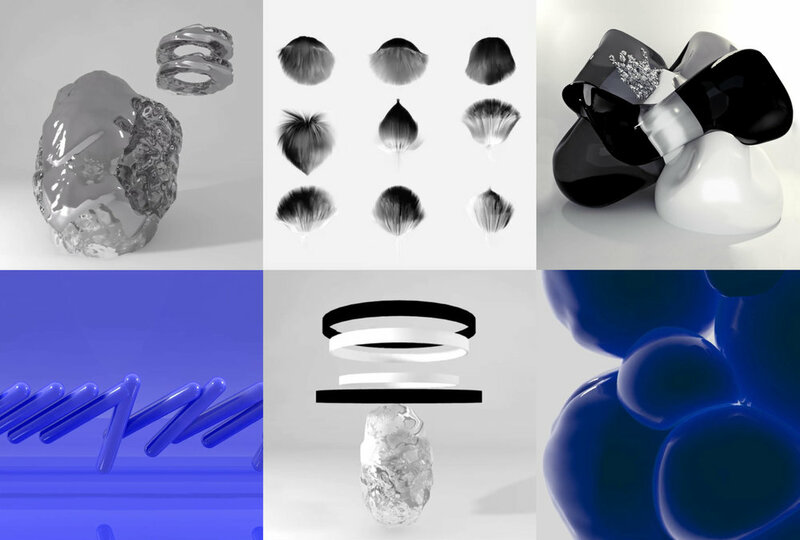 Therefore Growing A New Landscape is an installation using computer-generated moving image, a kinetic sculpture and a large scale print. Exploring the change of our biophysical landscape and our growing technological landscape, this project focuses on how an Augmented Reality can be used to create more sustainable interactions with our environment. The kinetic 360 moving image piece Space 2 is the beginning of an exploration of digital cities that could exist within the physical space. The film shows fictional isolated and non-isolated spaces that spin around the viewer’s head. Funded by art&technology institution Collusion this project uses and explores augmented reality's possibilities positives uses. How can we create sustainable spaces where essential physical objects have multiple digital experiences? How can this concept in return lead to less waste and new interactions in our environment? Digital Dynamics is an ongoing understanding of digital deamons and the simulation of material properties to create the best digital work, Augmented Reality Experiences and Virtual Reality Experiences. Questioning the future of physical and virtual materials, the studio is undergoing a research and design process to create a discussion with experts in the area of material science, computer simulation and software development in order to create a sustainable way of experiencing materials in the digital sphere. The studio created the artwork A Million A Minute which is one of the finalist projects at the Wired Creative Hack Award 2017. This project was selected as one of the finalist out of 437 summited projects and convinced the jury because of its speculative future design and research approach. SÊMA is an interactive art piece which was developed for Bloomberg’s new working space in London. Functioning as an inspiring room divider, SÊMA is not an ordinary wall which seperates people, more importantly brings people together through a transparent interactive communication way. Through activating a centred handle, the heart of the art work, a double pendulum within the wall, is set in motion. This pendulum includes magnets and effects therefore the position of the compass needles in the wall. SÊMA was inspired by the Semaphore (telegraphy) line by Claude Chappe, which was one of the first communication tools before technologies such as the web 2.0, computer hard- and software or the phone. What if physical art pieces are exhibited in the virtual space? Is this a way of sustainable object interaction or do we miss the fulfilment of physical materiality, physical space exploration and social interactions? Supported by the ICA London and in conjuction with Bloomberg New Contemporaries 2016, the project was developed in collaboration with curators Cristina Vasilescu, Kate Gu and Nilz Källgren, photographer (3D scans) Will Webster and the founders of Studio ABOVE&BELOW Perry-James Sudgen and Daria Jelonek. The 3D scanned artworks, which were exhibited in three virtual spaces, could be experiences through an Oculus Rift and Google cardboards. The event itself lead to talks&discussions, alongside large scale projection showing the different exhibition situations. The project can still be experienced in the WebVR space.